← Poles Apart – wrong process, right conclusion? I get annoyed with people who won’t accept how I describe myself. Those who respond to my self-description as an atheist by saying: “No you’re not. You’re an agnostic.” It’s interesting that this response usually comes from theists – and never from other atheists. “Here is a short form of the definitions from the two separate points of view. Theist version: An atheist is certain there is no God, an agnostic is not certain. Atheist version: An atheist believes there is no God, an agnostic doesn’t know. The two versions are only subtly different, but a great deal of hot air has been expended on this difference. There is a reason why some theists define atheism in these terms. If they define atheists as being 100% certain of the non-existence of God, then they can claim that atheists hold their view as a faith position. This appears to make some theists more comfortable, it frames the debate in more familiar terms – a religious battle between competing faiths. Also, by widening the definition of agnostic as far as possible, I suspect that some theists feel more comfortable with the idea that these waverers may in due course return to the one true faith. I myself prefer to define agnostic in a broader philosophical sense – one who believes it is impossible to know anything (see Agnostics – what do they stand for?). However, I realise that it is usually used in the sense of it is impossible to know if a God exists or not and am happy to accept that meaning when people use the term to self-describe their position. If we all accept each other’s self-applied labels, we can all get along much better. This entry was posted in agnostic, agnosticism, atheism, belief, diversity, faith, god, human rights, interfaith, religion, supernatural, superstition, tradition and tagged agnosticism, atheism, Existence of God, faith, god, religion. Bookmark the permalink. Most atheists are ‘weak’ atheists. It is only ‘strong’ atheists who have the audacity to say there is definitely no God. Ross – I really don’t like this ‘weak/strong’ classification but it seems to be a fact that while most theists “know” there is a god ( that is audacious isn’t it), very few non-theists classify themselves that way (see “Probably” no God – probably acceptable or just the graph of the data – https://openparachute.files.wordpress.com/2008/10/certainty.jpg). Yes, Ken, when people use words like ‘believe’, ‘know’, etc. interchangably, that certainly muddies the waters (and probably the ‘data’ in your graph as well). This is yet another example of the need to start conversations about ‘knowledge’/’knowing’ (gnosis), by dealing (at least at some level) with the underlying issue of epistemology (what is knowledge, what kinds are there, how do we get them, etc.???). Dale – the graph only describes what people self-reported. In an ideal world epistemological clarity on the part of the respondents might be helpful but it’s not going to happen in the real world. 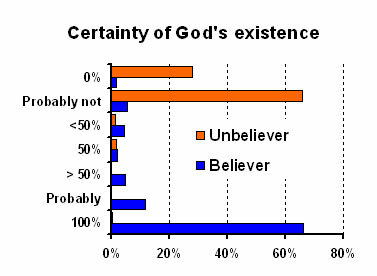 I find it interesting that such a high proportion of theists (~65%) declare a certainty compared with the low proportion of non-theists (~25%). On the other hand while only ~10% of theists declare “most probably,” 65% of non-theists prefer that description. Clearly this is not a issue of evidence (at least in a direct way) so why the different self description? Is it psychological (defensiveness perhaps), a different understanding of what certainty means, subjective experience counting as evidence, etc., etc? I just find that difference intriguing. Is it psychological (defensiveness perhaps), a different understanding of what certainty means, subjective experience counting as evidence, etc., etc? methinks ‘a different understanding of what certainty means’ (which was my point about epistemology). I’d love to see the questions used in the survey. Dale – have a look at Our Labels versus Our Beliefs. I think this gives an idea of the survey questions. It’s an interesting conflict: when looked at one way theists are using ‘belief’ with two different meanings, one usage for themselves and another for atheists. For themselves ‘belief’ doesn’t need evidence/proof/justification, they keep telling us that. But in trying to move atheists to agnostics on the grounds of “cannot prove”, they are asking that ‘belief’ have demonstrated evidence, etc., another meaning again. Of course, we could define theists as those who act as if there was a God. First of all, this would exclude all those who go around sinning and hope they’ll get away with it. Secondly, it would get rid of all those who, when they or their children get sick, go to the doctor instead of praying for health. Thirdly, the only ones who would pass muster would be the ones cheering when someone they love dies (and, presumably, goes to heaven). And, fourthly, any acknowledgement of doubt immediately gets you crossed off the list, too. Is this a silly position? Yes, of course, that’s the point. Wow – so your definition of ‘theist’ would only include those 1) with perfect self-control, 2) whose view of God necessitates that prayer and taking your child to the hospital are antithetical, 3) who have so a low view of current life that loss of it is not grieved, and 4) whose view of faith/trust is such that doubt is to be unexpressed/hidden/shunned/hushed/etc.? Like I said, a silly definition. Atheist – claims that there is no God. Generally (but not always) involves a complete denial of the supernatural. “Believes there is no God” is also a useful description; belief is not understood as being absolute certainty. Belief means that you find the worldview convincing and act accordingly. Strong agnostic – says that it is impossible to know whether God exists or not. Weak agnostic – says that they are not not convinced either way as to the existence of God. As I hope is clear, “Weak” and “Strong” are not meant to be perjorative in any way. The main reason for distinguishing between the two types of agnosticism is that the weak agnostic makes claims only about their won knowledge, whereas the strong agnostic makes claims about the limits of knowledge that is achievable by anyone. As you say, Sentinel, in your experience this understanding “is a commonly-held one among Christian theists.” And I think that is the problem. It tends to impose pre-conceived attitudes. In my view it also represents an over-eagerness to classify. In my experience atheists do not use such differentiation. It’s simply a matter of belief or not. In fact labels aren’t all that important. I understand where you’re coming from, but I do think that labels serve an important function. In order to have a productive conversation, it generally helps to have an idea of where the other person is coming from. I’m not saying that any label or classification system captures an individual adequately, but it does help to steer the conversation productively. For example: I’m a Christian. If I’m having a conversation about morality or philosophy with you, I will probably have a different conversation based on whether you are a Christian, or a Muslim, or an atheist. I’m not talking about evangelism, I’m just talking about a conversation. Which one of those three worldviews that you endorse will influence what I can take for granted as common ground, and what I can’t assume, and understanding that will improve the quality of our conversation. Life is too short to get into discussions with people who have mistaken preconceived ideas on one’s beliefs. These really get in the way. (It’s bad enough with a minimalist label like “atheist” which really seems to uspet some people. Political labels are even more obstructive). And self-labeling can be crippling. A way of using dogma as a crutch and avoiding thinking.